When William Cattley, a patron of horticulture in Barnet, England, flowered a large lavender orchid in November 1818, he started one of the most intense collecting adventures in horticultural history — an adventure that led to the introduction of a whole group of large-flowered lavender orchids that would dominate the orchid world and the public’s perception of orchids for the next 150 years. A few more plants like Cattley’s flowered in the Glasgow Botanic Garden in Scotland in the autumn of 1819, and the English botanist, John Lindley, wrote a description of the orchid in his book, Collectanea Botanica, published in 1821. Lindley called the glamorous new orchid Cattleya labiata, and, with a few strokes of his pen, immortalized William Cattley forever in the world of orchids. In the course of all this, however, history seems to have forgotten about William Swainson, the man who made it all possible. Swainson was a naturalist who battled his way through the uncharted tropical jungles of northern Brazil collecting mosses, ferns and other native plants to send back to botanical gardens like the one in Glasgow. Some of the plants he collected were C. labiata and both Cattley and the Glasgow Botanic Garden received these plants. Swainson had a remarkable impact not only on the discovery of C. labiata, but also on its future, for in the process of discovering it, he made it possible for the horticultural world to lose C. labiata for the next 71 years. How the entire horticultural world could lose a plant so valuable and sought after is one of the strangest stories in orchid history. Cattleya labiata was lost despite the efforts of the major orchid companies in England, France and Belgium that sent their best and most experienced plant collectors to Brazil from the 1830 through the 1880s to look for it. Swainson, of course, did not help things by forgetting to tell anyone where he collected C. labiata, and then disappearing into the wilds of New Zealand where no one could find him to ask him. Speculation by British horticultural authorities that Swainson had found C. labiata near the city of Rio de Janeiro did not help either. Then there was another naturalist, Dr. George Gardner, who traveled to Brazil in 1836 looking for butterflies, birds and horticultural what-not, who “confirmed” that C. labiata grew near Rio de Janeiro because he had seen it some 15 miles north of Rio on Top Sail Mountain and in the Organ Mountains. Gardner even sent specimens of the plants back to Eng-land to prove his discovery. Gardner made the further somber observation that Brazilians were destroying C. labiata’s natural habitats so rapidly to plant coffee and other crops that the species would probably disappear from the Province of Rio De Janeiro in a few years. With this frightening news, European collectors intensified their efforts to find C. labiata before coffee obliterated it, and they swarmed over Rio de Janeiro, but no one could find a single plant. Many concluded that Gardner’s prophecy had already come to pass; C. labiata’s habitats had been destroyed and the plant was now lost forever. It wasn’t until a French orchid collector, Louis Forget, had the audacity to suggest that Gardner had never found C. labiata in the Province of Rio de Janeiro because it never existed there, that things began to move toward a resolution. A frustrated R.A. Rolfe, editor of the The Orchid Review, “soaked out” Gardner’s dried specimens at Kew, and, after examining them in detail, concluded that Monsieur Forget was indeed correct. Gardner had never found C. labiata in the Organ Mountains or anywhere else in the Province of Rio de Janeiro. The plants Gardner found were Laelia lobata, which still grow there despite the nasty coffee growers. Gardner was good at misidentifying C. labiata and he sent everyone on a merry chase for years. On one trip, he discovered Cattleya warneri on the banks of the Parahyba River, which forms the boundary between the Provinces of Rio de Janeiro and Minas Gerais. Once again, he reported he had found C. labiata, and soon European collectors were excitedly searching the Parahyba River for it. When the prize was not to be found along the Parahyba, some orchidists began wondering whether C. labiata had ever existed at all in Brazil. In fairness to Gardner, at the time he visited Brazil, from 1836 to 1841, there was much confusion over the names of new species of orchids, particularly the popular cattleyas and laelias. New plants were often given different names even by the same investigators. None other than John Lindley, for example, first classified Laelia lobata as Cattleya lobata. So we must give Gardner an A for effort and credit him with unintentionally saving C. labiata from extinction at the hands of European collectors who were ravaging the jungles of their Cattleyas. In the case of C. labiata, they could not ravage what they could not find. All of this, of course, would not have happened if Swainson had simply told someone he had found C. labiata in Pernambuco and not Rio de Janeiro. He did write an account of his travels through Brazil in 1819 that should have given everyone a hint of where to find it. In the Edinburgh Philosophical Journal, Swainson wrote, “Instead of following the example of all my fellow-labourers by going in the first instance to Rio de Janeiro, I landed, about the end of December in 1816 in Recife, in the Province of Pernambuco…” Swainson did not mention where he found the then-unnamed “parasitic plants” (C. labiata), but the implications were clear, and 71 years later, in 1889, C. labiata was finally rediscovered where it had always been growing happily and undisturbed, in the Brazilian Province of Pernambuco. When it was rediscovered, it was found by someone who was not even looking for orchids. 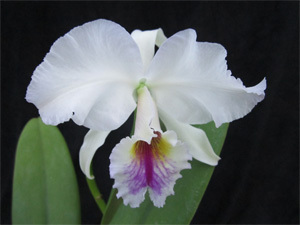 Cattleya labiata was rediscovered by a collector for a Monsieur Moreau of Paris. Moreau was a distinguished entomologist who had dispatched a collector to central and northern Brazil with a view to adding specimens of new insects to his museum. Since he also grew some orchids as a hobby, his collector sent him 50 plants of a large lavender orchid he found in Pernambuco. By an unbelievable coincidence, Frederick Sander of the British orchid firm Sanders Ltd., stopped to visit Moreau when the plants were just starting to flower and realized they were the long-lost C. labiata. Having no commercial incentive to keep its location secret, Moreau happily explained to Frederick Sander where his collector found C. labiata and the proverbial cat was suddenly out of the bag. The rediscovery of C. labiata was heralded by The Orchid Review as “the event of the year,” and the orchid world was soon awash with thousands of newly imported plants of C. labiata. Between its reintroduction in 1889 and 1907, the Royal Horticultural Society gave C. labiata 15 First Class Certificates and 22 Awards of Merit as plants with new and striking color patterns were exhibited. Because the large-flowered cattleyas were the most popular and sought-after orchids of the 1800s, a battle soon developed between the structural botanists like John Lindley and the horticulturists who grew these plants over what constituted a Cattleya species. As a result, we find Cattleya trianaei and Cattleya mossiae, for example, described as C. labiata trianaei and C. labiata mossiae, even by Veitch as late as 1894 in the Manual of Orchidaceous Plants. It is refreshing to see that for once the horticulturists won out over the botanists and today we call the large-flowered cattleyas by their own names and not as subvarieties of C. labiata. However, even the botanists are not of one mind on this point. But, we have remnants of those days that still haunt us. The terms “Cattleya labiata vera” and “Cattleya labiata autumnalis” still appear in publications, on orchid labels and in commercial catalogs as though these are specific clones of C. labiata. The terms “vera” and “autumnalis” were used when C. trianaei and C. mossiae were called varieties of C. labiata to denote C. labiata itself. “Vera” and “autumnalis” have no meaning today since C. labiata is now the true (“vera”) labiata, and all C. labiata flower in the autumn (“autumnalis”). Among the large-flowered cattleya species, C. labiata is one of the most interesting, not only because of its fascinating history, but also because it captures the middle ground of the large-flowered Cattleya species. In this sense, it is probably a good selection as a “type species” for the large-flowered cattleyas and they are often referred to as the Labiata Group of Cattleyas. Cattleya labiata is not the best-shaped Cattleya species, but it is far from the worst-shaped. It does not produce the most flowers on a flower spike, but it is a reliable producer of four or five flowers per spike. It is a relatively tall-growing member of the large-flowered cattleyas, taller than C. mossiae and C. trianaei, but not as tall as the Sanderiana forms of C. warscewiczii. It is a robust grower with a proud carriage and produces good-sized flowers that separate well on the spike. Flowers are normally produced from a double sheath unlike the Colombian and Venezuelan cattleyas that flower from a single sheath. Cattleya labiata is the only large-flowered cattleya species that blooms in the autumn, and is easily separated from its close Brazilian relative, Cattleya warneri by its flowering season since C. warneri blooms in the spring. Cattleya labiata is also light controllable and, as you shorten the length of daylight, you can actually make it flower at any time of the year. It flowers naturally when nature shortens the day length in the autumn. More than any other Cattleya species, C. labiata passes on good carriage to its hybrids. The flowers stand high on the plant and do not crowd each other. Good carriage is a quality sorely needed in many of our modern cattleya hybrids, since round-shaped flowers are not worth much on a plant that does not display them well. Cattleya labiata has a lot more color forms than C. warscewiczii, but not as many as C. trianaei. Its most common lip pattern is a solid dark purple with a pale lavender edge. There have been a number of fine white clones of C. labiata found over the years. Two of the most famous are E. Ashworth’s old clone ‘Harefield Hall’, and John Lager’s ‘Alba Plena’. The earliest whites to be awarded were ‘alba’, FCC/RHS (1892), and ‘alba Purity’, FCC/RHS (1907), which, like ‘Alba Plena’, have only a trace of yellow in the throat. The most famous semialba clones of C. labiata are ‘Cooksoniae’, FCC/RHS (1895), and ‘Mrs. E. Ashworth’, FCC/RHS (1896). Both of these plants produce striking flowers and have survived the last 100 years quite well. They are still grown by hobbyists today. Good lavender clones of C. labiata vary from pale lavender forms to some impressive dark clones like ‘Monarch’. Some breeding has been done between these fine old lavender clones to produce improved forms of C. labiata like ‘Aruba’, AM/AOS (1982), and ‘Bahia’. Although C. labiata heralds the beginning of the autumn season, its dominance of this time of year was relatively short-lived as many more-brilliant and floriferous autumn hybrids rapidly replaced it. By the time I was a teenager in the 1940s, primary hybrids like the intensely dark Cattleya Fabia (labiata x dowiana) or the brilliant Cattleya Peetersii (labiata x hardyana) were the standard September cut flower, not C. labiata. Many complex hybrids filled the October and November need for Cattleya flowers, and C. labiata all but disappeared from commercial production. This rapid replacement of C. labiata by autumn-blooming hybrids led to the disappearance of most of the fine old awarded lavender clones of C. labiata and sadly, only a few remain in cultivation today. Because it was the first large-flowered cattleya to arrive in Europe, C. labiata has been the victim of an endless number of fanciful stories about its discovery. One of the most whimsical is the anecdote that tells us that C. labiata was used as “packing material” for William Swainson’s ferns and mosses. The anecdote suggests, of course, that C. labiata was not recognized as having any value until it flowered in William Cattley’s greenhouse. While it is true that C. labiata was wrapped around the ferns, this was a mutual protection for both plants and was simply the most practical way to ship them. Swainson knew the beauty of C. labiata; he arrived in Pernambuco on the eve of its flowering season. Swainson also knew how pleased William Cattley would be with these plants, at that time thought to be considered parasitic, because European horticulture had never seen anything like them. Each new generation of orchid enthusiasts, it seems, must rediscover the large-flowered Cattleya species. As fashions change, they are sometimes lost for a while, but their elegant rich beauty, lovely fragrances, and endless variety have always made them a delightful companion for orchid lovers, and none of them can ever really be lost forever. CATTLEYA labiata is one of the most vigorous Cattleya species and undoubtedly the easiest to grow. It usually begins growing in February in the United States and will complete its new growth by June. If this growth is completed early enough, it will often make a second growth that will mature in late July or early August and both growths will flower at the same time. Depending on the clone, C. labiata will flower from September into November. After flowering, it should be allowed to rest, and water should be given sparingly. Too much water during its rest period will rot the roots and retard growth in the spring. 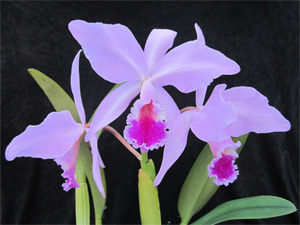 Like most other Cattleya species, C. labiata benefits from lots of sun and air. The leaves should be a light green in color if you want its five-flowered bloom spike. Repotting should be done in the spring as soon as the front pseudobulb begins to send out a flush of new roots. — A.A. Chadwick.